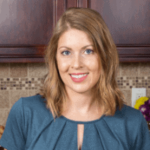 Published: Nov 18, 2015 · Modified: Feb 10, 2019 · By Jen Sobjack · This post may contain affiliate links. 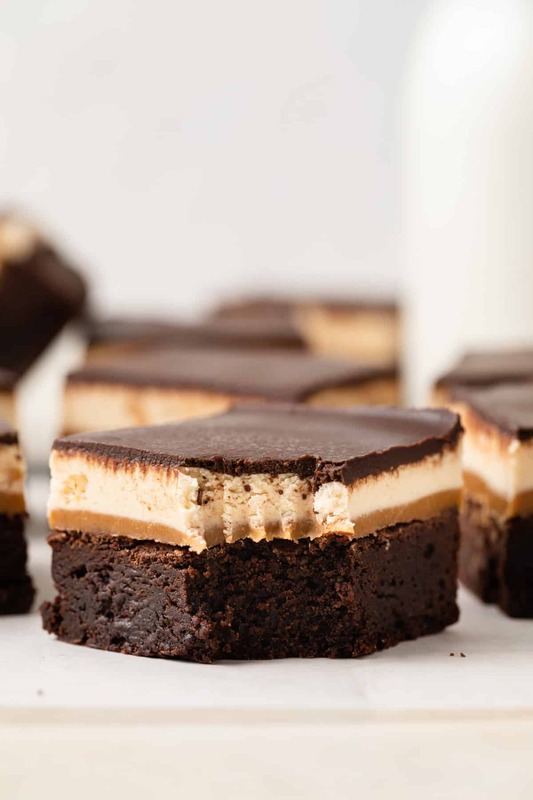 Combining brownies with a classic Snickers bar results in an incredible dessert experience. A thick triple chocolate brownie base, layered with gooey caramel, nutty marshmallow nougat, and topped with creamy chocolate. 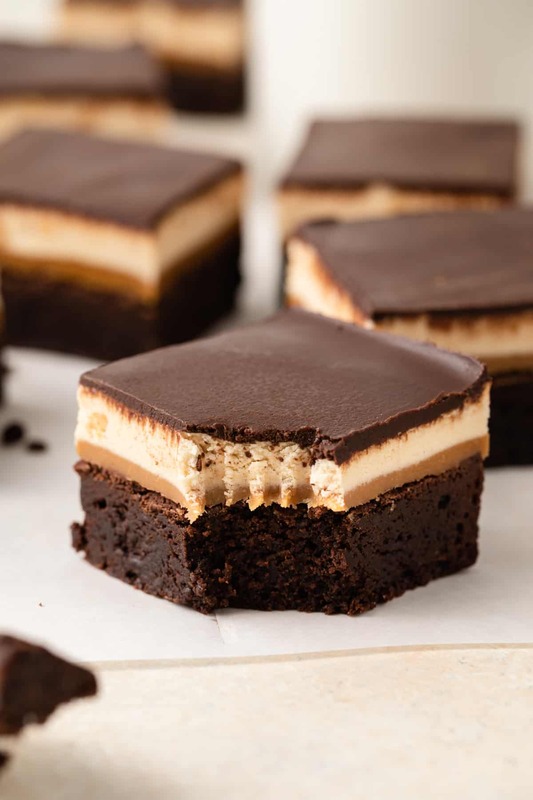 Once you try these over the top Snickers Brownies, you will be hooked! A thick triple chocolate brownie base layered with gooey caramel, nutty marshmallow nougat, and topped with creamy chocolate, this brownie recipe is pure over the top decadence! Today’s recipe uses my most favorite brownie base. I used it for these chocolate orange brownies and chocolate cherry brownies. Because these brownies are four layers of pure sweetness, I swapped some of the semisweet chocolate for unsweet chocolate in the brownie base. This lightened up the sugar load just a tad and added to the rich, dark chocolate color. Each layer needs to set before adding the next one. Because of this, the process of assembling the brownies is time-consuming. But trust me, it’s oh so worth it. Be sure to read through the entire recipe before you begin, so you know what to expect with each step. 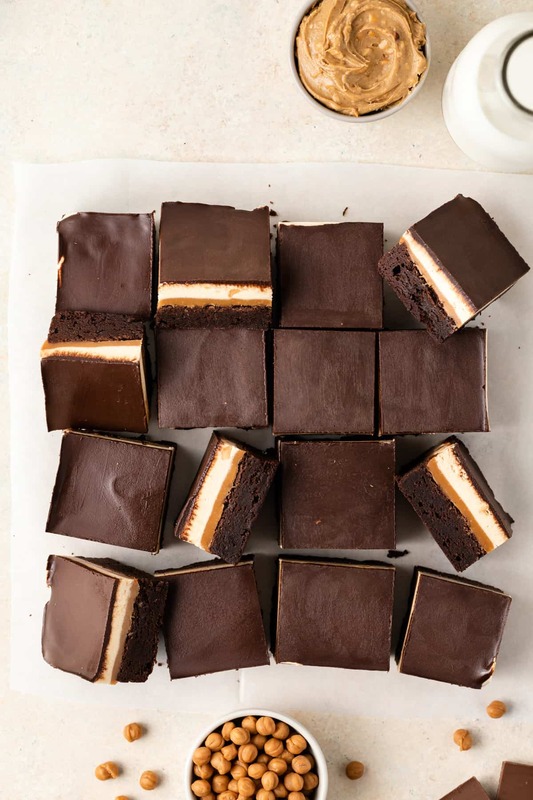 These brownies begin with all-time favorite base, with one minor adjustment – half the semisweet chocolate is swapped out for unsweet chocolate. This recipe is excellent when you want to sink your teeth into a thick, fudgy brownie. I turn to it anytime I have a craving for chocolate. It’s so dense and fudgy, with intense chocolate flavor. You are going to love the richness of these brownies! On top of the brownie base is a layer of gooey caramel. And I mean gooey! It’s made with two simple ingredients, caramel candies and evaporated milk. If you let the brownies sit at room temperature for an hour or so, the caramel will get soft and melty. It will drip out from between the layers. A nutty marshmallow nougat layer goes on top of the caramel. Crunchy peanut butter, marshmallow fluff, and creamy nougat combine to make this irresistible layer. And lastly, a rich creamy ganache coats the top, adding to the bars decadence. You won’t be able to resist this super snickers brownies recipe. Preheat the oven to 350ºF. Line an 8x8-inch pan with aluminum foil, leaving a 1-inch overhang on all sides. Spray the foil lightly with nonstick spray. Add the chocolate and butter to a medium heatproof bowl set over a pot of simmering water. Stir occasionally until fully melted and smooth. Whisk in the cocoa powder until smooth. Set aside to cool slightly. In a separate medium bowl, whisk together the eggs, sugar, vanilla, and salt until combined. Whisk in the melted chocolate until well combined. Fold in the flour with a rubber spatula just until combined. Spread the batter evenly into the bottom of the prepared pan. Bake for 20 to 25 minutes, or until the top of the brownies look dry and the edges begin to pull away from the sides of the pan. Cool the brownies in the pan on a wire rack. In a medium microwave-safe bowl, combine the caramels and evaporated milk. Heat on high for 2 minutes, stopping to stir every 30 seconds until the caramels have completely melted. Spread evenly over the top of the brownie layer. Place the pan in the freezer while you make the nougat layer. In a small saucepan, combine the sugar, evaporated milk, and butter. Bring to a boil over medium-high heat, stirring constantly. Turn the heat down to medium and continue to boil at a moderate rate without stirring for 5 minutes. If the mixture turns dark in color, you've boiled it for too long. It should be light in color and the consistency of sweetened condensed milk. Meanwhile, in a medium heatproof bowl, combine the marshmallow fluff and peanut butter. Slowly pour the hot nougat mixture into the marshmallow fluff and peanut butter. Whisk until well combined. Spread the nougat layer evenly over the top of the caramel layer. Place the pan in back into the freezer while you make the chocolate layer. In a medium microwave-safe bowl, combine the chocolate chips and oil. Heat on high in increments of 15 seconds, stirring well between each one until the chocolate is melted and smooth. Spread the chocolate evenly over the top of the nougat layer. Cover the pan loosely with aluminum foil and refrigerate for 2 hours. Lift the brownies out of the pan by the foil overhang and cut them into bars. Brownies will keep for up to 1 week stored in an airtight container in the refrigerator. Brownies will keep for up to 3 months stored in an airtight container in the freezer. Thaw in the refrigerator overnight. I was afraid of the brownie not being fudgy enough. I had to cook the brownie about 18 minutes longer. I kept doing the toothpick test every 3 minutes and continued to too much batter being left on the toothpick. So after about 18 minutes I had the right amount and the brownies came out very fudgy and not cake-like at all. I was happy that I left them in longer because they would be way undercooked If I hadn’t. If you’re worried about this just trust your toothpick test to monitor the amount of batter left on it and pull them out of the oven when you’re happy with the results. Next, just like some other comments I had an issue with the caramel not being soft and gooey (though, admittedly, I didn’t leave them out for an hour at room temp). I was afraid I had done something wrong and it affected the quality of texture and taste..but….I enjoyed them with the caramel more like this. I think the dessert would be very messy if the caramel was allowed to to get gooey. This is just a preference thing for me. I don’t like sticky things on my hands and I have 3 daughters all under 10 years old that will be eating these and I’m good with the dessert not being messy. I probably could’ve cooked the first half of the nougat mixture longer but I was happy with the results. When set, the nougat was firm but not hard. But it’s easily the messiest part of this dessert. All told, I followed this recipe exactly except that I cooked my brownies longer and I was very happy with it in the end. These are delicious and I can’t wait for my girls to try some! Could you substitute almond butter or other nut butters in place of peanut butter? Not a peanut fan. I haven’t tried it with other nut butters but I imagine it would be okay. The only thing that concerns me is the oils in the other butters. If there’s too little or too much it could affect the outcome of the nougat. Made them this weekend for a pumpkin carving party. Personally found the amount of sugar in the brownie layer far too much and was also a bit disappointed at how crunchy and sandlike the sugar remained. If I make this recipe again I am definitely going to look at adjusting the amount of sugar. This looks heavenly! Definitely on my to do list, thank you for sharing!! Made this recipe, tastes amazing! But we want to enter it in a 4-h baking contest and am having trouble cutting evenly through the caramel layer win out squashing the brownie and our nougat didn’t set up at all! Any suggestions? For the nougat layer, you may need to cook the syrup mixture longer. The thicker it is, the better it sets up. But be careful because you can over cook it. If it turns dark in color, you’ve cooked it too much. As far as slicing the brownies, I find using a hot knife works best. Run the knife under hot water, dry it off with a towel, and cut through the brownie. Repeat this with each individual cut. Would there be a way to make the nougat layer without the peanut butter (we have a non-peanut fan in this house)? You can try using almond butter or any other nut butter for the nougat layer. I haven’t tested this myself so I can guarantee how it will turn out. What a great recipe! I’m making these for my husband as a Valentine’s Day treat, but since I’m making them the day before, should I leave them out at room temperature overnight, or should I refrigerate them and take out an hour or so before eating? Just curious what works best… Thanks again for the delicious recipe! I would keep them refrigerated until ready to serve. Yes – I definitely realized that after baking them. They turned out great and my husband loved them, thanks again for the recipe! I am baking these now and the brownies are dry on top and are pulling, but I put a toothpick in and it is still wet in the center. I would think these need to be based through, but you don’t say anything about doing the toothpick test. Is this right? Should they still be wet in the center? I never do the toothpick test with brownies because I like mine to be fudgy and this is achieved by under baking them ever so slightly. However, if you want a more cake-like brownie then you’d need to cook them until a toothpick inserted into the center comes out clean. Thanks so much! I did end up baking them a little longer but I never made it to a clean toothpick, which did leave me with fudgey brownies. They were really good! Sure. If you have a great brownie recipe you love, just use that. Oh, cool. Thanks. These sound great , by the way. I just wanted to say thank you so much for this awesome recipe!! My daughter chose this as the recipe she wanted to try for her Girl Scout bake off based on the photos and I agreed without reading through it. When it was time to bake I have to say I was quite nervous for her (considering she’s 8 years old and rules are she needed to make it herself with supervision only). Your directions were so easy to follow and she stepped up to the challenge! Using this recipe she won at her troop level, the Association level, and at our first ever county level! She has volunteered to make them again this week for a bake sale at school and refers to them as her award winning brownies! 😊 Thanks again! That’s so exciting! Congrats to your daughter on her outstanding baking skills. I’m happy to hear the brownies were a huge success!! So, using 1 TBSP evaporated milk with the caramels made a wreck of my bars. Every other part was perfect; the caramel was too hardened and set, even when left out. I only melted the caramels and didn’t raise the temp up high, I think it was just too little liquid. I’ve used near that recipe for a caramel filling from Ree Drummond who adds a TBSP of butter along with the evaporated milk. The bars were awesome around it though. I’m sorry you weren’t pleased with the caramel layer. It’s odd that it hardened so much for you. I found it to be quite gooey after letting the brownies come to room temperature. Butter is actually not necessary when melting down soft caramel candies. You only need a liquid such heavy cream, milk, water, or evaporated milk. Of course, the more liquid you add the thinner the caramel sauce will be. Since the caramel went in between layers on the brownies, I wanted it to be soft and sturdy, not runny. Snickers are on my list to top 3 favorite candies. I love this brownie version…every single layer of it! Pinning. Thank you so much for the pin, Thao! Oh my goodness, all those layers! 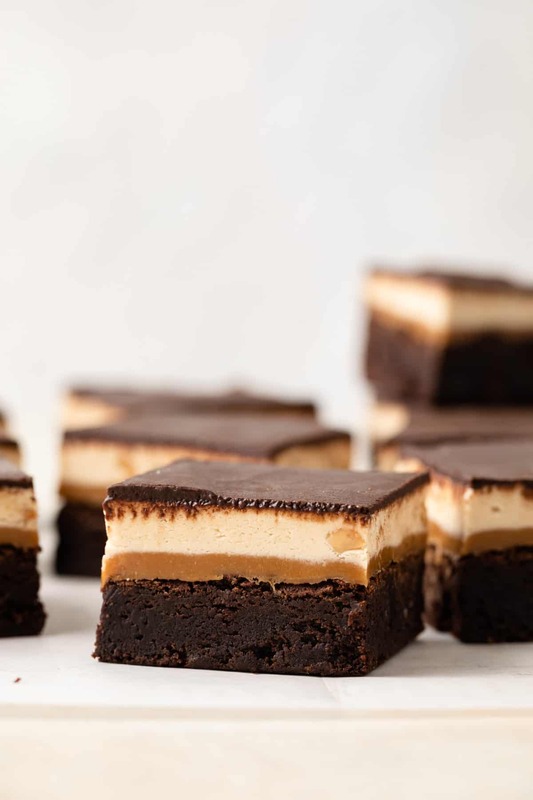 Jen, I’m dying over here These brownies are absolute stunners and I am completely obsessed! This brownie is everything I have ever wanted in life! Pinned! Dang, girl!!!! these brownies are amazing!!!! Snickers are my fave!!!!! Oh my! You just combined my two favorite things into one amazing dessert! These brownies are total perfect, Jen! oh my goodness Jen, these look like they’d be my new favorite brownies ever! That caramel layer and that nougat layer?! I cant wait to try these! There are no words to justify this masterpiece! 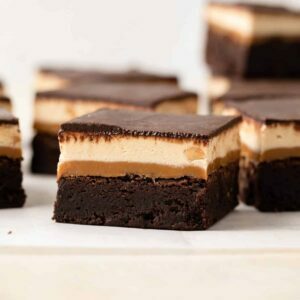 I almost passed out when I saw that gooey caramel running down the sides of these decadent brownies! These are the most incredible brownies I’ve ever seen. That nougat?! Amazing. Definitely need a batch of these for the Monday blues! My roommate LOVES anything to do with Snickers, and I can only imagine how excited she would be if I made these for her!! These are definitely going on my “to-make” list 🙂 they look amazing! Oh my goodness, these brownies look SO incredible, Jen! Love the Snickers twist, such a great idea! These would be gone in no time at our house! Oh Jen. . .you have succeeded in making my tummy officially crave brownies. The layers look absolutely amazing and i think they are well worth the extra time it takes to achieve them. As a matter of fact I am sitting here wishing that I had one right now to go alongside my pot of tea. These turned out awesome Jen! Mouthwatering! Need to try them! Pinning! Okay, these brownies look amazing!! I need these in my life! Oh my god, my mouth is seriously watering! These are insane Jen!! That looks so sinful Jen. Whoa, love how rich and gooey these look! Jen, these look out-of-control amazing! And that gooey caramel layer? Insane. I have to try these—I’m salivating over them!! Thank you for the lovely comment, Pamela! These look amazing! That nougat layer looks to die for 🙂 Pinning!! Thank you so much for the pin, Medha! These look fantastic! I love your dressed-up brownies. It just doesn’t get any better! I think I am going to make this recipe to give as gifts to my in-town friends and family. Thank you for sharing! Thanks, Sandra! Your friends and family are going to love these! They are indeed an experience! A delicious one. Thank you for the kind words, Cheyanne! Yes. That’s pretty much all I have to say. Unless it’s “hell, yes.” These are magical! I hear you, Mir! Thank you! WOW!! These look incredible! Those layers! Simply amazing! I love snickers and know that I would love these brownies even more. That caramel layer is calling my name. So good! Snickers is the best candy bar, hands down. Wow do these brownies look amazing, Jen! My stomach is literally growling right now. I love the thick brownie texture and caramel on top. What a perfect dessert! Thank you, Gayle. They were a huge hit around here.